The three greatest fools of History have been Jesus Christ, Don Quixote... and me! Variant: The three greatest dolts in the world: Jesus Christ, Don Quixote, and I. A state too extensive in itself, or by virtue of its dependencies, ultimately falls into decay; its free government is transformed into a tyranny; it disregards the principles which it should preserve, and finally degenerates into despotism. The distinguishing characteristic of small republics is stability: the character of large republics is mutability. 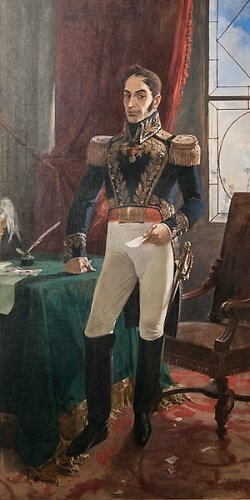 Bio: Simón José Antonio de la Santísima Trinidad Bolívar y Palacios y Blanco was a South American revolutionary leader.